As another season is upon us the Broncos secondary continues to age. As it seems to have become a yearly tradition, the Broncos try to infuse a little youth into the secondary. This year was no different as a number of changes were made to the secondary personal. One such player is Omar Bolden. Omar Bolden was born December 20, 1988 in Ontario Califronia. He graduated in spring 2011 with a B.I.S. degree in Interdisciplinary Studies (Justice Studies/Sociology). Bolden attended Colony High School in Ontario, California, where he starred at running back and defensive back. Bolden was first brought up to Varsity as a Freshman against Ontario High School to play running back. This game was played at Chaparral high school due to a massive fire that prevented any local games from being played. His first two carries of his high school career resulted in fumbles. As a senior he ran for 2,003 yards (143.1 yards per game) and 26 touchdowns and amassed over 2,500 all-purpose yards. He averaged 143.1 rushing yards-per-game as a senior and also caught nine passes for 150 yards (16.7 yards per catch) and one touchdown. On defense, he totaled 80 tackles, two blocked punts and one interception. Bolden was named CIF Central Division Most Valuable Player and the Inland Valley Player of the Year after leading Colony to its first CIF title in 2006. He led the Mt. Baldy League in scoring and rushing yards in 2006 and won the league rushing crown by over 1,000 yards. He also recorded over 700 rushing yards and six touchdowns as a junior, despite missing four games due to injury, but still earned All-Mt. Baldy League honors and was chosen as Colony High's Most Valuable Player. He was a 2007 graduate of Colony High School. Considered a four-star recruit by Rivals.com. Bolden was listed as the No. 7 all-purpose back recruit in the nation. He ran a 4.35 40-yard dash at the 2006 Scout.com Los Angeles Combine, the fastest by any player at the camp and the fourth-fastest among participants at Scout.com′s 13 nationwide high school combines throughout the year. Ranked as the preseason No. 37 player overall in the West and the region's No. 6 cornerback by Scout.com also rated as a four-star prospect by Rivals.com and Scout.com. Not only these guys but he was highly rated by others. Listed as a preseason All-American and the No. 43 cornerback in the nation by SuperPrep and also regarded as the No. 36 player in the state of California and the state's No. 6 cornerback by SuperPrep. He was rated as the No. 7 all-purpose back in the nation and the No. 31 player in the state of California by Rivals.com. He was regarded as the No. 5 running back in California by Rivals.com and listed as the No. 16 cornerback in the nation by Scout.com. He also was named the No. 38 player in the Farwest in the postseason by SuperPrep. Omar Bolden grew up watching Heisman Trophy winners Carson Palmer, Matt Leinart and Reggie Bush. Southern California, where his heroes played, was "my school," Bolden believed. Even now, years later, it's somewhat mystifying that Bolden would choose to play football at Arizona State rather than USC. Many remember his televised signing-day announcement, still viewable on YouTube, when Bolden was about to don a USC hat and instead flipped it at the camera and pulled an ASU hat from behind his back. "I wasn't mad, no hatred," Bolden said. "I wasn't trying to be disrespectful. I really didn't like the way they recruited me. It was the bunny with the carrot in his face. They played with me. I didn't like that. "If they wanted me, give me the (scholarship) offer. Honestly, if they would have gave me the offer, I probably would have committed there." USC dragged its feet on an offer in part because of doubts about whether Bolden would qualify academically. The concern was legitimate - Bolden wasn't cleared for enrollment until six days after preseason practice began - although Bolden never doubted himself. "I kept telling them (USC coaches), 'Look, I'm going to give you my word as a young man becoming a young adult that I'm going to make it,' " he said. "I had plenty of other schools that offered me and believed in me. I didn't think it was fair to keep them waiting, either. I felt I made the right decision. I have no complaints, no regrets. I love it here." It doesn't hurt that at the time ASU was 9-1, ranked seventh and alone atop the Pac-10 standings at 6-1. Five-time defending Pac-10 champion USC (8-2, 5-2) was No. 11. Bolden received several other offers, from schools including Michigan, Nebraska, Oregon State and Washington. He was one of ASU's most highly-acclaimed signees of the 2007 class. This was due to his blazing speed and the ability to star either in the offensive backfield or the defensive secondary and considered one of the most exciting athletes in the state of California in 2006. At the time he was praised for his ball skills as a defender, mainly resulting from his experience on offense. "This kid is like ice water or something, because nothing is too big for him," cornerbacks coach Al Simmons said. "The greatest thing is his confidence. He's been confident even when he struggled a little bit. He's playing better, so now he's getting more confident. He's got a great mind-set, because if he doesn't make a play, it's over and he can move on and feel like he can still win a majority of the snaps and win the game for us. I don't think he'll let this game or any other game affect how he's going to play." That assessment is no surprise to Bolden's former coach, Anthony Rice. Bolden was a star his last season for Rice's Ontario (Calif.) Colony High team that won the state Southern Section Central Division. Colony opened in 2002. Bolden played varsity for four years and was integral to the progression from a 1-9 record to 12-2 and a title. "You don't see a lot of kids like that," Rice said. "He's hungry all the time to succeed; that's what makes him a great athlete. The kid is humble, willing to work and willing to listen." Bolden said he constantly is learning, not only from Simmons and Tryon (senior corners) but also from other teammates. "I wouldn't say I'm taking his style," Bolden said of Tryon, "but I like the way he carries himself on the field. His swagger. He's kind of teaching me to get my own swag. That's one thing I didn't have coming out of high school." Maybe not as a cornerback. But it takes nothing but swagger to turn down USC and help ASU turn the corner. Bolden was an instant starter as a freshmen and earned Freshmen All-American in the 07 season. As a true freshman in 2007, Bolden played in all 13 games, making nine starts for the Sun Devils. He became a starting cornerback in the fifth game of the season, and remained a starter for the rest of the year. He made his first career tackle in season-opening win over San Jose State on Sept. 1. In his first career college start, he intercepted a pass in the second quarter and returned it 29 yards for a touchdown to help ASU to a victory at Stanford on Sept. 29. He also had four tackles (two solo) in the win over the Cardinal. He recorded two tackles and a pass break-up at Washington State on Oct. 6 and against Washington on Oct. 13. He collected a season-high five tackles (three solo) in win over California on Oct. 27 andhad three tackles and two pass break-ups at Oregon on Nov. 3, and posted three tackles at UCLA on Nov. 10. He recorded four tackles and a pass break-up in victory over Arizona on Dec. 1. He matched his season high with five tackles (four solo) in Pacific Life Holiday Bowl against Texas on Dec. 27. He recorded 33 tackles (24 solo), six pass break-ups and one interception, which he returned for a touchdown, on the season. He earned First Team Freshman All-American honors by the Football Writers Association of America, as well as Second Team Freshman All-American honors by Rivals.com and College Football News. He was selected to the Pac-10 All-Freshman Team by The Sporting News. He won the Bill Kajikawa Sun Devil Award, given to the team's most outstanding freshman, at the team's year-end banquet. In his sophomore season, Bolden started all 12 games at cornerback and finished fifth on the team with 49 tackles (37 solo). He totaled seven pass break-ups and two interceptions on the season. Bolden received Honorable Mention Sophomore All-American by College Football News that year. He had two tackles in season-opening victory over Northern Arizona on Aug. 30 and recorded three tackles in win over Stanford on Sept. 6. He collected six tackles (all solo) and a pass break-up against UNLV on Sept. 13 and posted a season-high seven tackles (six solo) and had a pass break-up against No. 3 Georgia on Sept. 20. He had five tackles (four solo) at California on Oct. 4 and recorded his first interception of the season at No. 8 USC on Oct. 11. His interception came on the second of three straight possessions in the third quarter that the Sun Devils picked off Trojans quarterback Mark Sanchez. He collected six tackles (five solo) and a pass break-up against Oregon on Oct. 25 and had four solo tackles, including a tackle for loss, at Oregon State on Nov. 1. He totaled four tackles and two pass break-ups in win at Washington on Nov. 8 and posted two tackles in victory over Washington State on Nov. 15, as part of a defensive effort that produced ASU's first shutout in 12 seasons. He recorded five tackles (four solo) and a pass break-up in win over UCLA on Nov. 28 and had three tackles at Arizona on Dec. 6, and collected his second interception of the year when he picked off Wildcats quarterback Willie Tuitama in the end zone late in the second quarter. 2009 was the first bad year Bolden had at ASU. He recorded an interception, a pass break-up and four tackles (two solo) in the first four games of the season before suffering an injury in practice during the week leading up to game at Washington St. He sat out the remaining eight games of the year in order to be healthy for the 2010 season. He did return a kick 89 yards for a touchdown against Louisiana-Monroe, his first career kick return for a touchdown. He gathered 123 yards on two kick returns. By 2010 he was a unanimous 1st Team All PAC 10 selection as a redshirt junior. He excelled in a dual role, both as a cornerback and kickoff return specialist. He was one of only four unanimous selections for the 2010 All-Pacific-10 Conference First-Team as selected by the league's coaches. He also earned Midseason All-Pac-10 team. He had team high seven pass breakups for the season, which also matched his career high he set in 2008. He also led Sun Devil defense with three interceptions for 85 yards and collected 52 tackles, including 37 solo stops for the year. He brought home Kickoff Returner Performer of the Week honors Sept. 18 vs #11 Wisconsin due in part to a 97 yard kickoff return at the end of the first quarter to give the Sun Devils their first lead of the game. He earned College Football Performance Awards Football Bowl Subdivision Honorable Mention Cornerback Performer of the Week Oct. 9 by having three tackles, including two solo and a three-yard tackle for loss in the game and intercepting the Huskies' final pass to clinch the win for ASU. He received an Honorable Mention Defensive Back Performer of the Week Nov. 6 vs USC due to his five tackle (four solo) performance as well as a 66 yard interception return. He returned 11 kickoffs for 321 yards and a 29.2 yard average. For his work as a return specialist, Bolden also was named Second-Team All-Pac-10. He earned Hard Hat player recognition for his work in ASU's offseason strength and conditioning program. In March of 2010, the much loved Bolden was granted an additional year of eligibility for the Sun Devil football team, as his medical hardship petition was approved by the Pac-10 due to missing almost the entire 2009 season because of injury. But 2011 just wasn't meant to be. He missed the entire season due to an ACL injury. Even though he was still named a team captain and earned Hard Hat player recognition for his work in ASU's offseason strength and conditioning program. In summary he was a highly recruited cornerback who was a five-year member of the Sun Devil football team and a four-year starter in the Sun Devil defensive backfield. He appeared in 41 games in his career, including all 25 played during his first two seasons at ASU. He made 22 consecutive starts from the fifth game of his freshman season in 2007 to Sept. 19, 2009. He recorded seven interceptions and 21 pass break-ups in four seasons and also had 138 career tackles (100 solo). Plus he was named to several Freshman All-America teams in 2007. Bolden is a superb cover corner capable of playing on an island. He is at his best in bump-and-run coverage, where he can recover after stabbing. He is also effective in zone, where he can trigger his foot and drive to make a play on the ball. He has speed to start at the next level and the body control to adjust on a ball while covering at full speed. Bolden has played inconsistently and can get caught looking in the backfield while playing zone. He is a solid all-around prospect, but he may have trouble working out of the slot early in his career in sub-nickel packages, as he solely has worked outside at Arizona State. Bolden was a productive three-year starter at left corner for Arizona State. He missed the final eight games of the 2009 season due to tweaking the MCL in his right knee and sat out in 2011 with the ACL injury. Therefore his recovery and return are integral to his value. When healthy, he is a big, athletic cover corner with second-round value and the ability to start immediately. Out of one of the worst experiences a college football player can experience, Omar Bolden emerged with a new, and entirely positive, perspective. 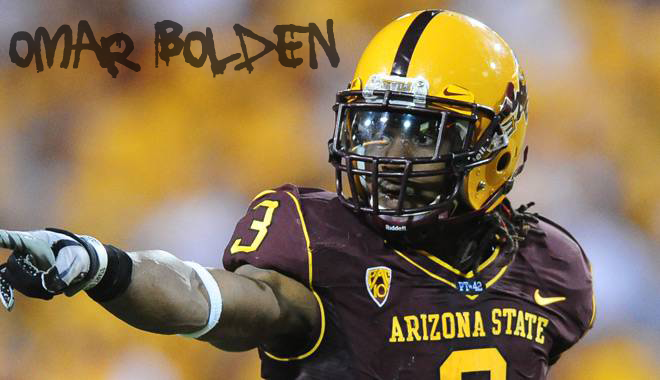 Bolden could have left Arizona State with a fifth year of eligibility remaining to enter the NFL draft in 2011. Instead, the popular and talented cornerback called a news conference to announce he wanted one more year with the Sun Devils. A few months later, during spring practice, Bolden tore his ACL — an injury that ended his final college season before it began. Bolden considers himself a budding cornerback and CEO. To think, an injury on the field led him to become an inspirational entrepreneur off it. Usually such an affable and upbeat person, Bolden slipped into a funk over the prospect of sitting out again. Soon, those feelings turned into a vision as he hit on an idea: What can he do to brighten someone's day? Like that, he created a "Positive Living" movement. He began a website touting the benefits of optimistic thinking and designed elastic bracelets. He also sends out uplifting messages. Bolden developed a personal mantra of "positive living" that he preaches in interviews and includes, in hashtag form, at the end of most of his social media messages. "I've always been a positive, high-energy guy," Bolden said. "But it really came about when I got hurt. It was a really hard time for me. I really wanted to come back and help my team win. For me to lose that whole season, it was pretty hard. I just have a tight circle of close friends and we're real big on positive energy. It kind of just started as 'live positive, live positive.' We turned it into 'positive living.' Then, we started tweeting about it." "Before you know it, a lot of people were just catching on and it turned into a movement. It wasn't planned, it just happened like that." Bolden remained a part of the Arizona State team, so much so that he was selected a captain. He said he attended every practice, every defensive meeting and traveled to each game. It helped him cope with the fact that he wasn't playing, though it couldn't replicate the experience he needed to prepare for the NFL. "I stayed involved. I traveled to every game, went to every practice, went to every meeting," Bolden said. "I played my part. But it was just hard to watch." Had the knee injury not erased his senior season, Bolden likely would have been a first- or second-day draft pick. Instead, he fell to the fourth round — where the Broncos drafted him. In the 2012 NFL draft Bolden was selected 101 overall by the Denver Broncos. With that venture taking off, he's now eager to begin his other business: Being a shutdown cornerback. The team drafted him in the fourth round, believing they received a steal of a deal as he slipped down the board due to his injury-filled past. No matter where he was picked, he's here now. And that's all he cares about. The power of positive thought at work. He has been cleared by the Broncos' medical staff and said he has felt completely healthy since early March. "It's good to be back on the field, just competing again," said Bolden. "Just to have the opportunity to be out here and play in the NFL and for the Broncos, it's an amazing opportunity." "I'm just excited to have this opportunity to play in the NFL," Bolden said. "Coming off a knee injury, missing a whole year, I see myself as very blessed and fortunate. A lot of guys would love to be in my position, so I'm going to take full advantage." 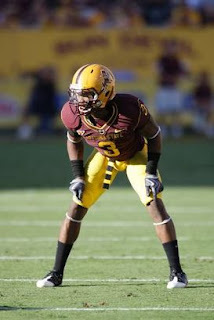 When healthy, Bolden was a standout defensive back for the Sun Devils. He had three interceptions and broke up seven passes in 2010, giving a glimpse of what he could do. Even when he wasn't healthy, Bolden was still a contributor. Last season, he was a voted captain in part because of his energizing and engaging attitude. About that time, he began hatching his idea of inspiring others. It was his way of keeping from tumbling into a melancholy. "I've seen many of my friends go through the same injury and distance themselves from everything, from football and friends," Bolden said. "I didn't want to go down that road. I learned from their experiences." His website has a mission statement that counts this as its principle tenet: "It is about making the decision to be a positive impact on the lives of the people you are around on a daily basis. A family member, friend, co-worker or even a stranger. You have the ability to affect people's lives with a simple action. Let that action be positive. Life is too important to let opportunities slip by." That edict now empowers Bolden. Bolden joined other Denver rookies at Dove Valley team headquarters for what marked his first practices since he was injured almost a year ago. His last full-speed work came late in his 2010 season. Bolden, listed by the Broncos at 5-foot-10 and 195 pounds, played left cornerback and had a variety of special-teams roles, including kickoff returner and gunner on punt coverage, for Arizona State. 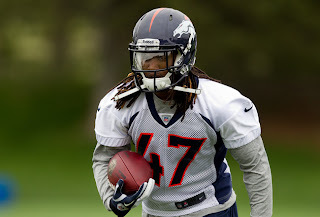 Bolden lined up at left cornerback during the weekend minicamp, but he probably will move around when the rookies join the veterans for the Broncos' first full-squad minicamp. "I thought he played well and he reacted to our install very well. He has good football awareness and football intelligence," coach John Fox said Sunday at the conclusion of the rookies' minicamp. "It's just a matter of learning to compete at this level at a consistent basis, and I believe he can do that." Bolden can't wait until he has a chance to pick up pointers from perennial Pro Bowler Champ Bailey. The Broncos also have veterans Drayton Florence and Tracy Porter for Bolden to lean on as well. "They've been around for a long time. There's a reason why they're still here," said Bolden, who no longer wears a protective knee brace. "Seven-to-10 years later, I want to be one of those guys that are still around. I'm just going to do my best to stick in their pocket, stick in their ear and learn as best as I can." With such an abundance of defensive backs, Bolden's role in the upcoming season may be in special packages on defense or possibly as a special teams contributor. 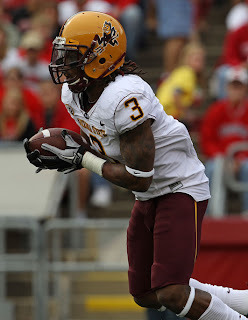 He was a returner at Arizona State, even bringing back a kick 97 yards against Wisconsin in 2010. Willing to slip into that role again? "If they give me the opportunity, yes, I'm going to take it and run full speed with it," Bolden said. "I've got my speed back; I'm ready," Bolden told reporters at Dove Valley. As a kickoff returner, he averaged 30.8 yards on 17 returns, with two touchdowns. "Any time I can get my hands on the football, I like it," Bolden said. Bolden is surrounded by quite an ASU support system with quarterback Brock Osweiler being drafted by the Broncos in the second round and receiver Gerell Robinson coming on board as a college free agent. "It's always good to come in with somebody you know," Bolden said. "Obviously, you come in with a class full of rookies and everybody's going through the same thing. But when you can look to your right or to your left and know that you've been through similar situations like this for the past three-to-four years with guys that you kind of consider as your brothers, it helps. "It makes it a little easier to transition to the NFL." Measurables: 5-10 1/2, 195-202 pounds Was one of the strongest defensive backs at the scouting combine with 24 repetitions in the bench press and ran a 4.45 40-yard dash at his April pro day. Upside: He was one of the fastest players in college football and plays the ball well with at least six pass break-ups in three of his seasons. Active player who had 52 tackles from the secondary in 2010 to go with 49 tackles in 2008. High enough character that he was named a team captain this past season despite the fact he was out for the year. Can also play in the return game. Question marks: A huge medical question given he lost most of two seasons with knee injuries, including ACL surgery a year ago. If Bolden can stay healthy and learn the Broncos playbook he could have a very productive year and career ~ Aussie. This is why I keep coming back to your site. Informative posts about new additions without the know it all attitude some of the other sites seem to have. Good read G.
I know some of this is copy and paste so I will mention one part that I had a hard time comprehending. Early in the article it talks of Tryon a couple of times, but you must have edited out where it says who he is. After reseaching it a bit, I came up with Justin Tryon, currently with the NY Giants. Is this right? You said, "As it seems to have become a yearly tradition, the Broncos try to infuse a little youth into the secondary." I personally like that we do that. Most fans would prefer to use draft picks on offensive weapons. I can see why, they are higher profile. To not have depth on D though is the worst thing that a team can do though. We found this out a couple of years ago when Doom went down for the year and we had no one to apply any sort of pressure at all. Bolden (and Judie) are steals as far as depth at CB in case injuries hit us there. I see Omar as a possible future replacement at Champ's spot. This year though I see the defensive backfield being Porter at RCB, Champ at LCB with Florence at NCB. Harris, Bolden, Squid and Judie as backups. At safety I see Mike Adams and Rahim Moore possibly winning the starting posistions with Q.Carter, Bruton and Ihenacho all making the roster as backups. 12 may be to many IDK. That's my guess though. 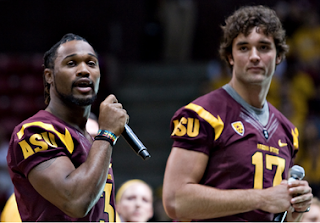 Tryon was the senior corner at ASU, I should probably add that. I like adding to the youth of the secondary I just hope some of these guys would stick. We need someone to step up and take Champ's spot eventually. I can see us keeping 6 and 4 or 5 and 5, so 10 spots. But I think 6 and 5 is unlikely unless that 5th safety is a stud special teamer. Also I agree with you. Champ, Porter, Florence, Harris, Bolden, Squid and Judie all could get spots but that is 7. This will be the most interesting battle at camp. Trading Vaughn gave Squid a chance I thought. I forgot even though we freed up a spot at CB in that move, we filled it with signing Florence. We still don't have enough room. Maybe Judie wouldn't be stolen off the PS, but I bet he would. Personally I don't have a thing for Squid the way you do. I would rather he was cut than to get Judie stolen away. Someone will have to be on the PS though. I like Squid because he has the perfect nickname. What little we have seen of him has been good, he is a turn over machine. But I also was really high on Judie through the draft process. He has some talent and ability but needs to stay healthy. Most likely one of these guys goes down. Squid, Bolden and Judie are all coming back from injury. It could come down to who lasts through training camp. What I find funny (I think I said this in your review before the draft too) is how they state Bolden is big. LOL He's 5'10". Maybe they say that because he is around 200 pounds and benched 225 24 times. At any rate I'm still not thrilled with Champ being our tallest CB at 6'0". I wish we only drafted 5'11" or taller CBs. I think at 5'9" and better return guys drafted Squid is a gonner. Porter is only 25. I wish we had gotten him to sign for two years. I hope we can re-sign him next year. I think he will want a lot more money than this year though. He is probably just doing a one year stint in Denver. I am the same, when I look at Corners I model them off Champ. But it is a hard position to play when you are a taller guy. I agree 5'11 or 6'0 is the size of corners we should draft. But Bill Walsh did say football players come in all shapes and sizes, Darrent Williams for one. Bolden I think looks big because he is muscular. You look at that photo of him and Osweiler and you would say he has the bigger arms. He is a physical presence. Squid I think can succeed at nickel or dime. These guys I think need to be a bit smaller because they have to do a lot of running in space. I have a feeling if Bolden and Florence play those positions they will struggle. Harris and Squid in my mind should be nickel and Dime. Bolden and Florence will back up the guys on the outside and may play on say a tight end or a bigger receiver set. To be honest with the number of guys we have it will allow our defense to be very versatile. And each player can have a specific role in that defense. As for Porter we knew he was only going to be here a year. He comes in, plays well and boosts his value from the Saints bounty scandal for a long term contract most likely elsewhere. How 'bout another one G? I still have to do the Danny Trevathan one. The other two princess was going to do but she has been busy. I will hopefully get around to the Trevathan one soon and have it up by the end of the week. Great we signed Blake now as well. Hopefully we have a decision on Warren soon and Prater under contract. Would also be nice to have Clady on an extension. Looks like Warren decided to show up. Time for him to go to work and not get injuried!